This time an annual Nokia's conference was held in the beginning of November in Barcelona, the city which is going to receive the 3GSM congress in about several months. Most probably that was exactly the move of the 3GSM congress from Cannes to Barcelona that influenced the choice of the place for the Nokia's conference. And last year the conference took place in Monaco not far from Cannes. 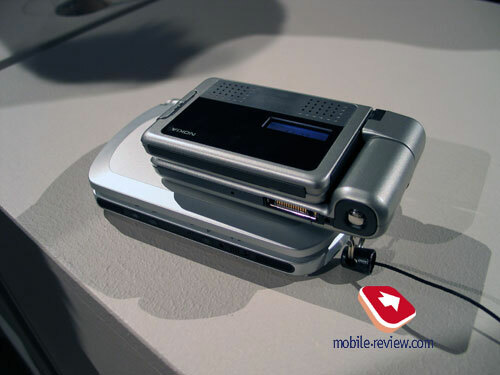 Last year three phones on various platforms were announced at the conference. Let us revise these models. 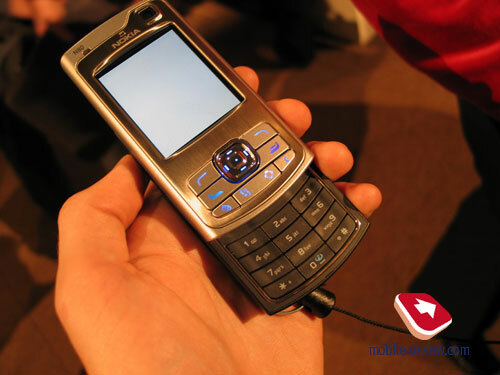 Communicator Nokia 7710 was the first and the only commercial product based on Series 90. 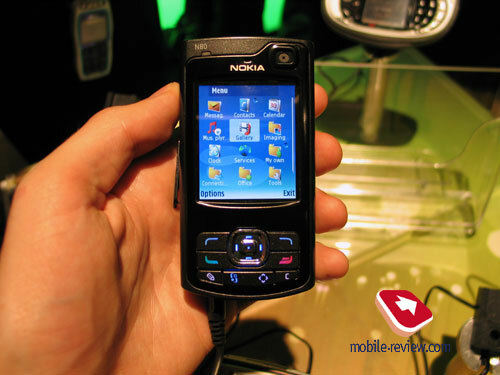 A cheap youth smartphone Nokia 3230 based on Series 60 and mobile phone Nokia 6020 run by Nokia Series 40. Also a plenty of various accessories was demonstrated last year. And this year the company has altered its priorities. Series 90 now becomes a part of history together with Nokia 7710, and Series 40 s forced away by Series 60 smartphones more and more. 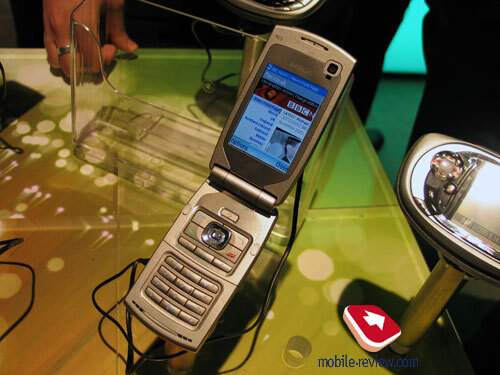 The company expects the world market of smartphones and communicators (the company's terminology calls them convergence devises) to have achieved the level of 100 million terminals by the year 2006. The most of the market will be taken by Series 60. 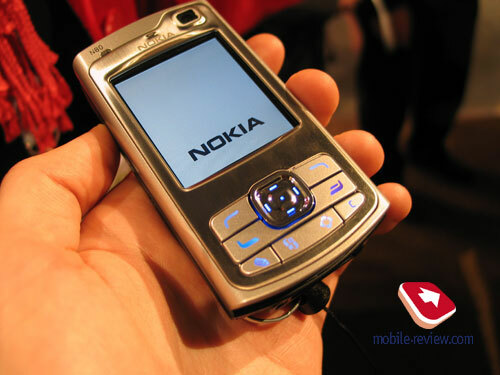 An indirect confirmation of the great role of Series 60 in Nokia's product line is the fact that about 99% of Nokia's employees used either Series 60 smartphones or Nokia 9300 during the conference, and usual phones were extremely rare. Following its tradition this year the company has announced three new phones. And it's no surprise they all are based on Series 60. Now before passing to the smartphones particularly, I'd like to give a short story about the other represented things at the conference. The change of the platform logo and name. This event took place a day before the conference, though still deserves attention. Series 60 was officially announced in November 2001, and now after four years it changes its name and appearance. Now it is called just S60, and this is not an abbreviation, this is a full name. That is how you should call the platform since now. The logo represents a tricolour star, which joined the top right corner of the platform name. And what do a new logo and name provide? Some separation from Series 40 and Nokia, since the platform is used by other makers also, not only Nokia. The browser stretches a page into one column without horizontal scrolling (this function first appeared in Opera browsers and then in other solutions). Supports the main W3C standards. The browser is an Open Source development. Releasing it Nokia established an opensource.nokia.com portal for supporting Open Source simultaneously. And now we can pass to considering the innovations. 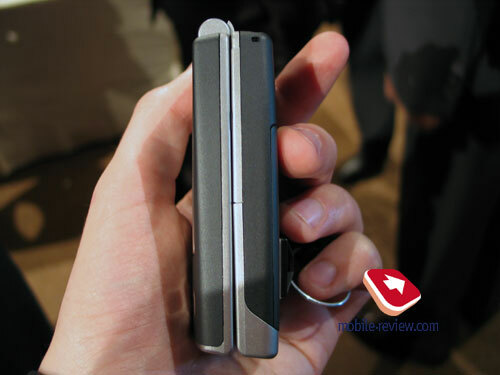 The company announced three S60 devices within the Nseries. All the products are based on the third edition of the S60. We will not give details on it here, since that deserves a special talk. We will surely provide with the review of the S60 in the nearest future. 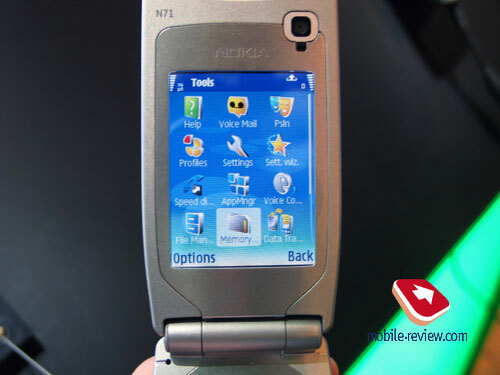 Nokia N71 belongs to the beginning level of the Nseries. 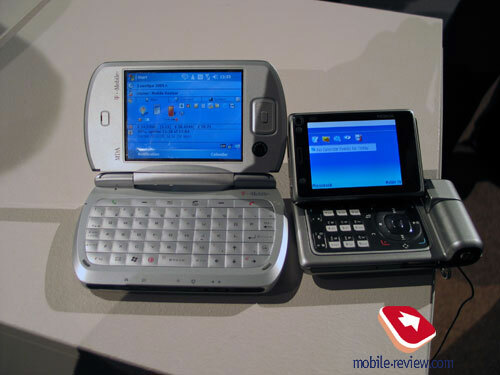 This is a clamshell, which exceeds the N70 in functionality. And the N70 is also a start level model of the N-line. 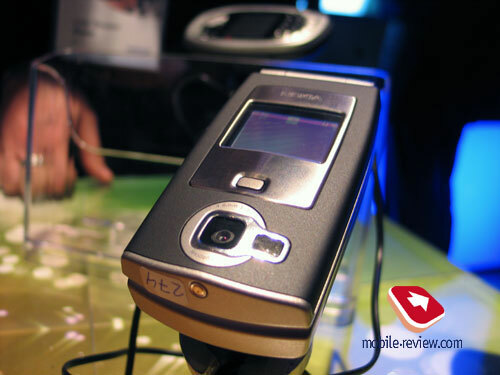 The main emphasis in the N71 is placed on musical capabilities and a large screen. As we have already told, the model is designed as a clamshell. And in contrast to the previous smartphones (Nokia 6260, Nokia N90), the screen is not rotary, however a large colour display is integrated. 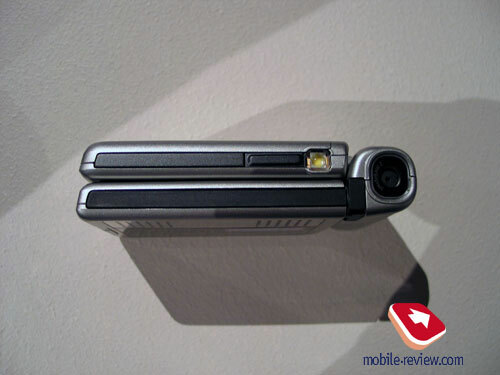 Near the external screen and 2MP camera with a flash found room, it is equal to the one of the N70. 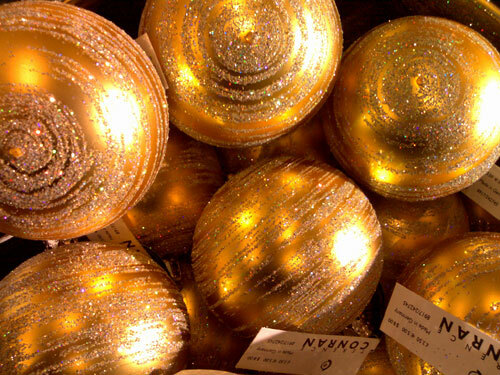 The body is made of plastic, however with metallic insertions. An open device can be fixed in two positions, which are completely open and half-opened. Number keys crowded in the bottom, and I think that at such big size of the smartphone, they could provide with higher comfort. Two hollows are seen under the number block - these are stereo loudspeakers. 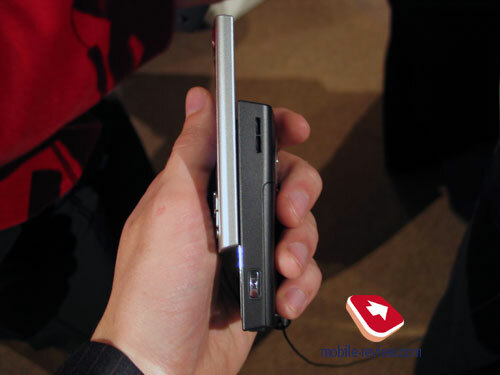 The device is rather large (98.6x51.2x23 mm) and heavy (139 g), due to the absent rotary camera block it is slightly smaller than Nokia N90 and is much lighter (Nokia N90 weights 173 g). The screen with a QVGA (320x240 pixels) resolution takes an intermediate position between ones with 176x208 pixels and 352x416 pixels. It is capable 262K colours. The dimensions of the screen are unusually big - a diagonal of 2.4" is used in non-touchscreen smartphones for the first time. 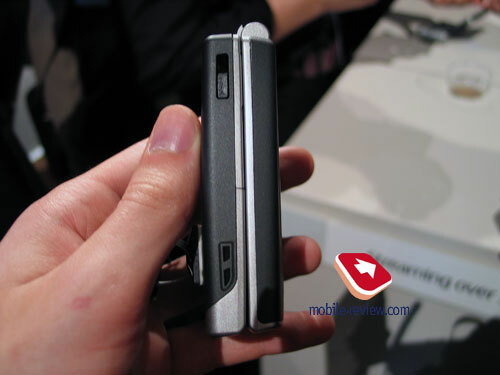 The N71 uses a removable Li-Ion battery BL-5C capacious of 970 mAh. Announced working time reaches 9 days in standby mode and up to 3 hours of talks. Certainly WCDMA, EDGE and Bluetooth are supported. And IrDA returned to Nokia's smartphones even in the E-line. But Wi-Fi is absent; this wireless adapter is integrated only in top solutions. As we have already told, this smartphone is intended for playing music. In addition to 10 MB of inner memory there is a miniSD connector (gradually the company replaces RS-MMC with this standard). Songs are easy to transfer to the smartphone using USB 2.0, and at the same time you won't need special software for synchronization or a driver. The integrated player provides a 5-line equalizer and a capability to search for albums and artists. An adapter, which will help to connect usual 3.5 mm headphones, is shipped with the smartphone. And separately you can buy an adapter for listening to the music on a musical center (Apple iPod's influence is recognizable). An integrated radio supporting Visual Radio is present. 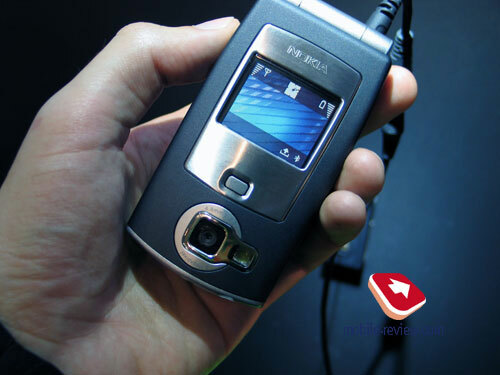 Thus we can consider musical capabilities of Nokia N71 the maximum possible if not considering the limitation on the miniSD capacity (1GB, and soon 2GB cards will be available). However, musical capabilities of all three models are equal. 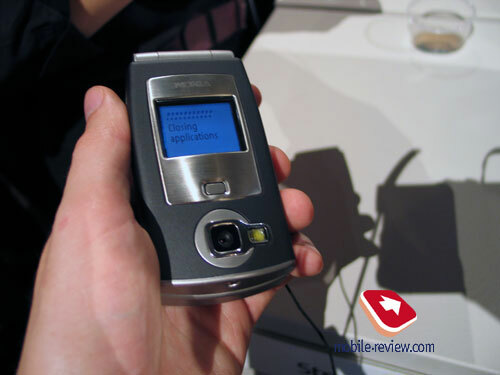 The N71 will be available on the counters in the first quarter of 2006 for about 400 Euros. 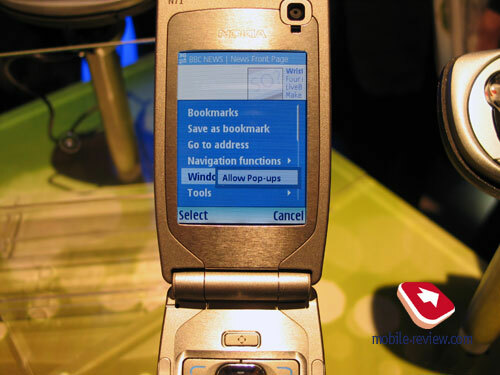 After Nokia 7650, which the S60 started with, this is the first time when the company of Nokia represented a model in a highly demanded slider form-factor. The body is partly chrome-plated and partly is made of stainless steel. Only a number block of 12 buttons is on the bottom part, almost all the actions can be carried out with the slider closed. Phone dimensions are not small (95.4x50x23.4 mm), which is similar to the weight (134 g). These indexes exceed the ones for Samsung D720 (99x47x22 mm, the weight - 110 g). And at the same time Samsung D720, which is almost the only rival of the N80 loses in all other parameter. The screen is 352x416 pixels in resolution (the only of the three announced), but shows 262K and has a 2.1" diagonal. The bank of internal memory reaches 40 MB, and an expansion slot miniSD is present. 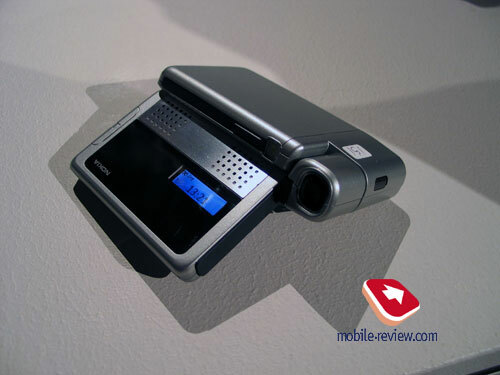 As we have already told, musical capabilities are equal to Nokia N71. The battery is BL-5B capacious of 820 mAh, and according to the manufacturer, it allows about 3 hours of talks and up to 8 days of standby time. Now about unique features of the N80. 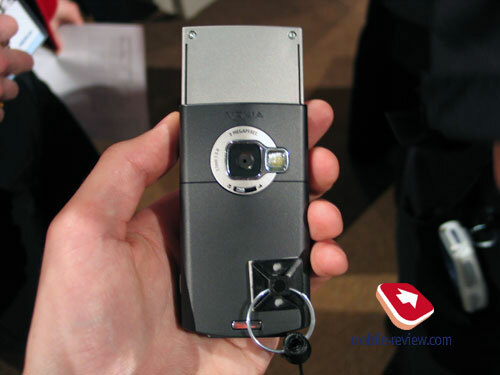 That is the first time that Nokia uses a 3MP camera (the maximum photo resolution reaches 2048x1536 pixels). 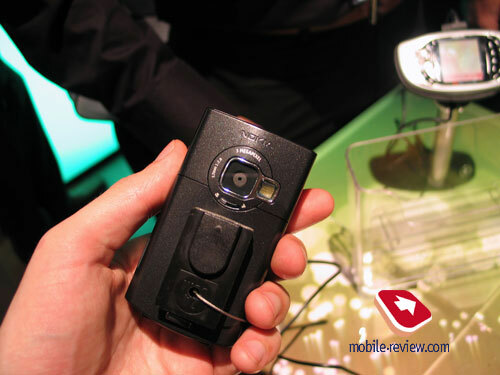 The camera is equipped with a flash and a special switch for a macromode. This is placed under the camera gap. Video is recorded with the resolution of 352x288 pixels, 15 fps, and a video stabilizer is announced. 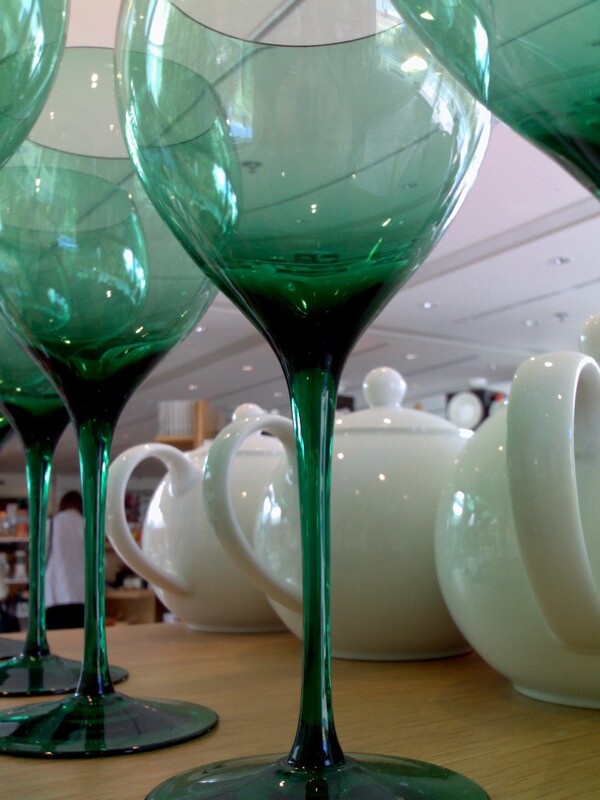 You can get acquainted with sample photos by Nokia. But one should understand that really such quality is hard to achieved (studio lighting and an impromptu stand). 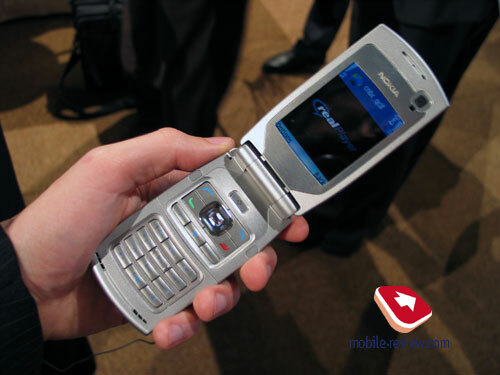 Nokia N80 supports all possible interfaces - quadruple GSM band, WCDMA 1900/2100 (for the first time! ), GPRS/EDGE, IrDA, Bluetooth, Wi-Fi (IEEE 802.11g), and USB 2.0 (connected without drivers and a necessity to turn the device off). Also we'd specially note the support for Universal PnP (UPnP), which is an heir of a wire PnP. With its help and Wi-Fi connection established, you can translate slides to a TV set and music to s stereo system. In some way UPnP is like some addition to the infrastructure (for instance, to Wi-Fi) in the person of Bluetooth-like services. This standard will be widespread in future, and even now a list of companies supporting the standard is rather impressing. You can acquaint with a complete documentation of UPnP. The model will be available in the first quarter of 2006 for 500 Euros. 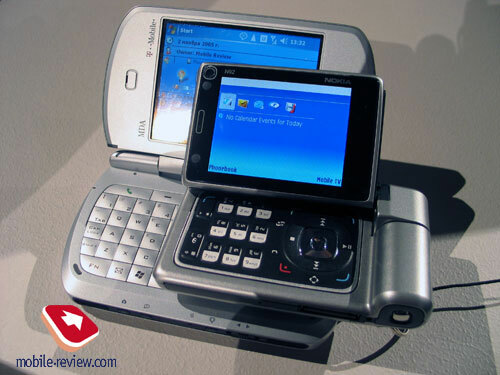 Nokia N92 is the nominal top product in the Nseries. 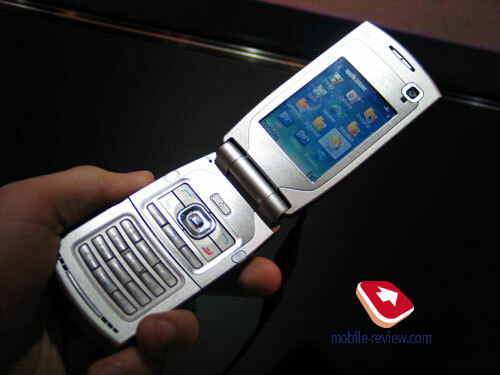 However in some functions (camera, screen resolution) it loses to the N80. 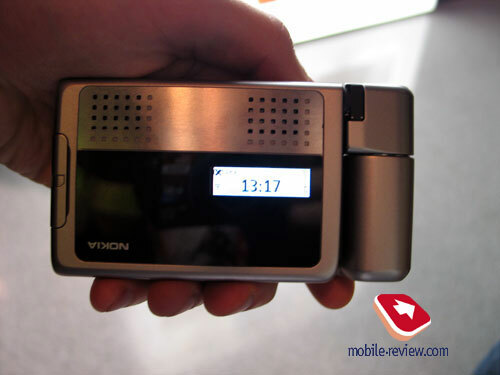 This is the first company product supporting DVB-H (Digital Video Broadcasting Handheld) - digital television. However not the first on the market, the company of Samsung had time to distinguish in this field. The DVB-H standard was approved last year, and now pilot projects are being started, problems with licensing of frequencies are settled down. Theoretically in a point the number of channels can reach 50. 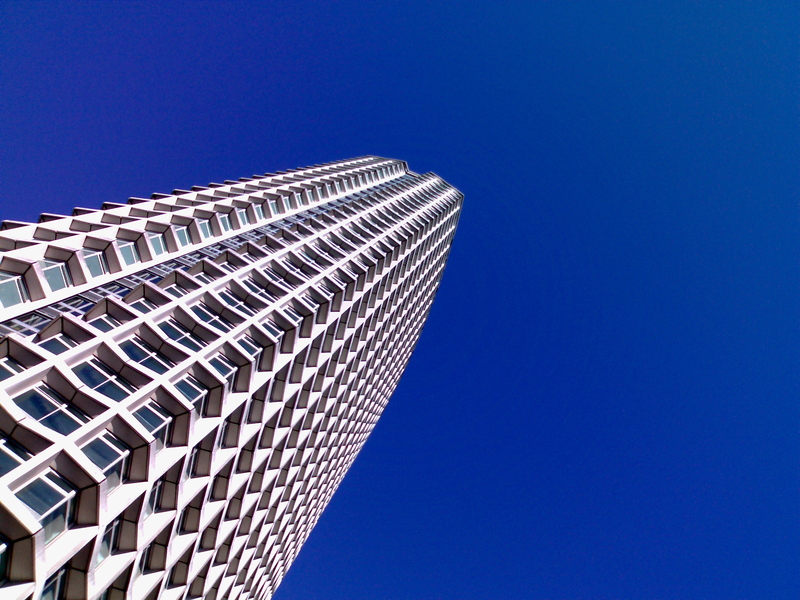 Image quality is optimized for the needs of mobile devices. Here we will not give details on the DVB-H standard, and if you wish, you can acquaint with a detailed report on the condition of mobile television by DigiTAG. Let us return to the smartphone. 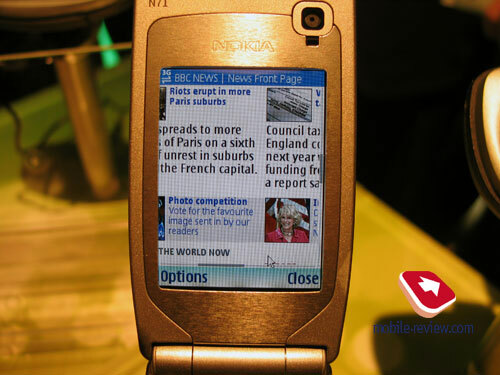 In dimensions and weight (107.4x58.2x24.8 mm, 191 g) Nokia N92 exceeded even Nokia N90, they are comparable with a cancelled model by Motorola MPx. And the matter is certainly a large screen and an integrated digital TV receiver. Both mentioned smartphones by Nokia get unacceptable for many customers due to their big size and weight. Not opening the smartphone, you can see a small line of the screen and all necessary system indicators, caller's name, but not his/her photo on it. And also here are the grates of comparatively loud stereo loudspeakers (the sound can be heard even in a very noisy place). 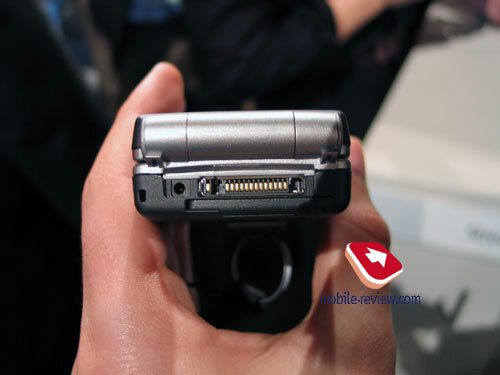 Opening mechanism is close to Motorola MPx and Samsung D300. 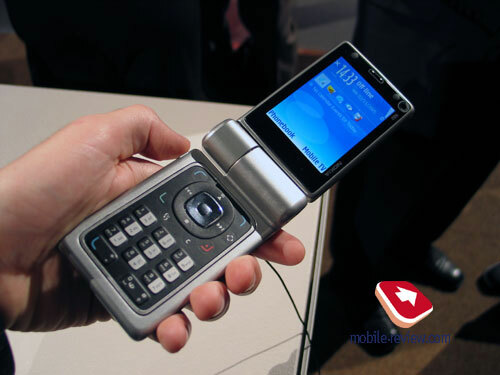 And in mentioned models album mode was used for comfortable work with a QWERTY-keypad. 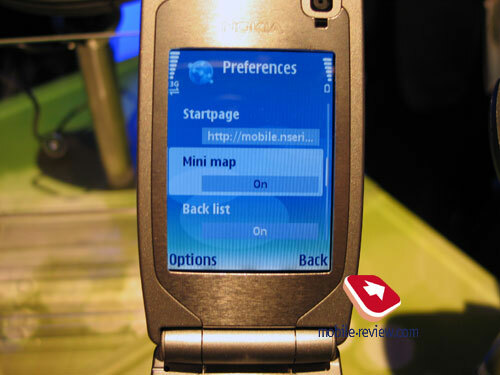 In Nokia N92 it is required for viewing programs, and correspondingly a QWERTY-keypad is absent. 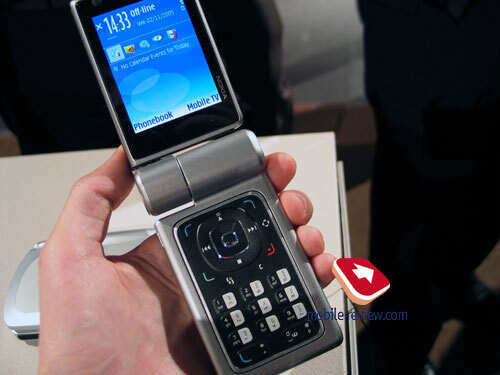 It's possible to suggest that future heirs of Nokia N92 will gain a QWERTY-keypad besides reduced size. Speaking about the screen, we can call it almost the best among smartphones. It diagonal is the maximum - 2.8" (42.4x56.64 mm), as well as viewing angles and 16 million colours. However screen resolution is QVGA, but not 352x416 pixels. Well, on opening the screen in album mode and pressing the only button, you can start watching TV programs. First, you select an appropriate channel of available ones (at the same time a short description of the channel, its logo and a program schedule are viewable), and then start watching. The battery allows watching programs for about 4 hours (it is 1500mAh). You can record programs on a miniSD memory card (support for cards up to 2 GB is announced), and a 30 second repeat is present. This model will be available in the middle of September 2006 for about 600 Euros. And by that time the main rivals will represent their solutions with integrated DVB-H.
Now the company of Nokia gradually returns its former technological leadership after the last unsuccessful year. New developments (IEEE 802.11g and i, UPnP, DVB-H, 2-diapason WCDMA) are represented either first or not later than by others. 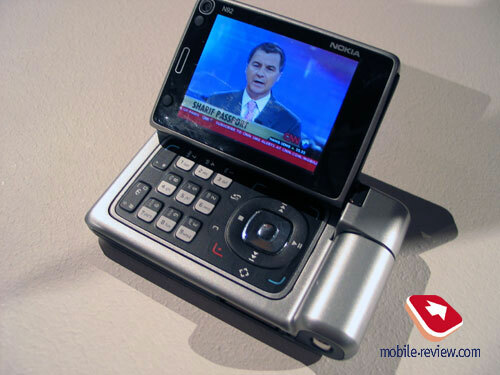 We think that the slider Nokia N80 will become the most popular. 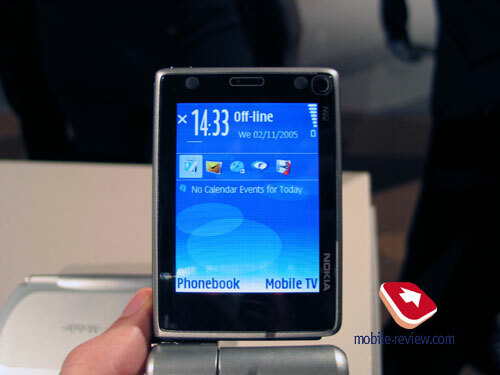 Nokia N92 is intended for demonstrating Nokia's technological superiority and advanced technologies. 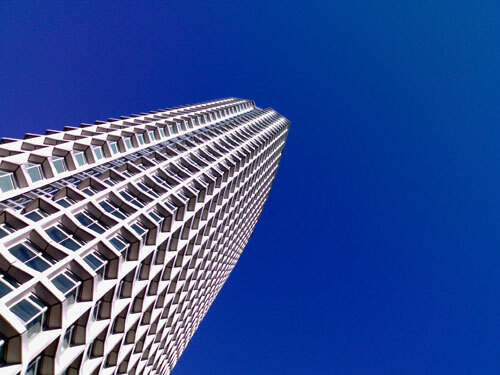 The company doesn't expect this model to be commercially successful; this is a demonstration of Nokia's capabilities, a device to test DVB-H networks (also Nokia offers infrastructural solutions for DVB-H). 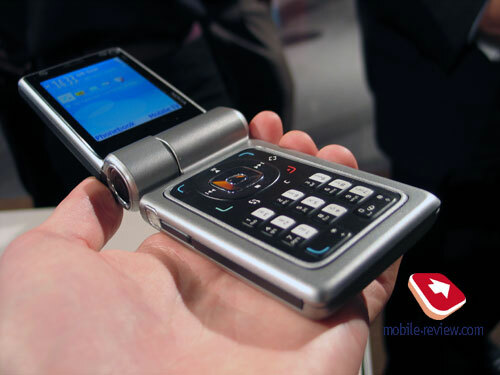 Nokia N71 is a comparatively cheap clamshell with a large screen and great musical capabilities, its popularity will be moderate.